With a history in manufacturing that stretches back to 1962, Glidewell Specialties Foundry Co. is well-trusted as a quality-driven resource for custom machining components. 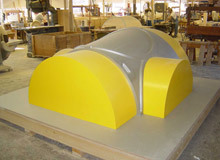 Exemplifying our high level of expertise is our casting, pattern design, and manufacturing services. We have five highly skilled, full-time pattern makers on staff. Our advanced CNC milling machine and manual milling equipment accommodates a variety of materials, including wood, foam, metal, and plastic. In addition to manual and CNC machining, we employ basic wood working with lathes, drills, saws, and planer mills to fabricate patterns that the client owns after manufacturing, and that last on average of several years. In addition to pattern design and manufacturing, we also offer 3D modeling and MAGMA solidification modeling services. We handle storage on-site for our customers’ patterns, and everything is organized within our Foundry Computer System. At our advanced facility, we handle volumes that range from prototypes to long, high volume production runs. The quality of our products is assured by our status as an ISO 9001:2008 certified company, a status we have held since 2010. To learn more about our pattern design and manufacturing capabilities, please see the table below or feel free to contact us directly.